With the holidays upon us, we realize there’s an increased desire to burn candles for ambiance and religious practices. Because of that, we tend to see an increase in incidents involving candles. Protect your family and your home by practicing candle safety this season and observing the tips below. 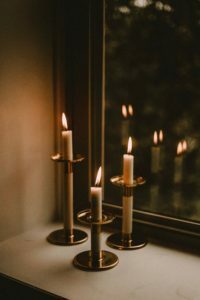 Candles caused 2% of reported home fires, 3% of home fire deaths, 7% of home fire injuries, and 4% of the direct property damage in home fires. Roughly one-third (37%) of home candle fires started in bedrooms. These fires caused 36% of the associated deaths and 51% of the associated injuries. Falling asleep was a factor in 11% percent of the home candle fires and 21% of the associated deaths. On average, 23 home candle fires were reported per day. Three of every five (60%) of home candle fires occurred when some form of combustible material was left or came too close to the candle. December is the peak time of year for home candle fires. In December, 12% of home candle fires began with decorations compared to 4% the rest of the year. and other areas where people may fall asleep. from anything that can burn. loose clothing away from the flame. is used in the home.